The A3 is Audi's popular compact luxury car, a classically styled sedan that gives drivers superb handling on the road, enhanced fuel economy and a powerful engine capable of meeting any demand around town or on the highway. The four-cylinder, 2.0-liter engine packs a powerful 186 horsepower and 221 pound-feet of torque into its compact size. Utilizing the design of Audi's TFSI turbocharged engine, the A3 base model reaches 60 mph in just under seven seconds. Upgrade to the A3 Quattro and improve to 220 horsepower, 258 pound-feet of torque and increase the acceleration rate to just under six seconds to reach 60 mph from a standstill. 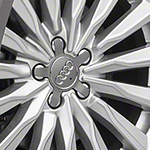 The Audi A3 also offers the Driver Select system in three modes, Comfort, Auto and Dynamic. Select Comfort for a long drive when the A3 shifts its resources to ensuring a cushioned suspension for smooth driving. Auto mode balances resources equally. Dynamic mode shifts the focus to steering and agility for responsive driving on challenging roads.